Even if you think you are eating healthy there is a good chance that you are still filling your body with a batch of excess sugar every day. A bowl of cereal alone can easily send you over the recommended quota for daily sugar intake. The biggest problem with cutting back sugar is the taste – it makes everything tastes so delicious! But that doesn’t make it any less evil when you are having too much of it. 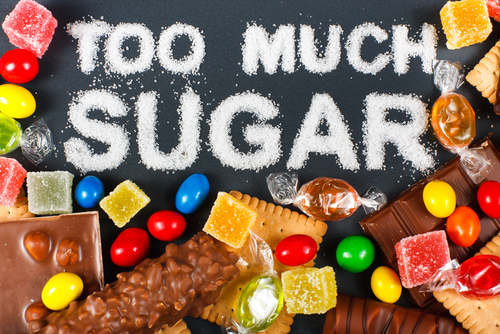 The other problem with too much sugar in your diet is that the damage is being done slowly. You may not even notice the bloating. The headache. The cranky mood. You just think that’s ‘part of your day’. But it may not be. So, where do you start? How can sugar be cut out of the diet quickly and simply? Here are my tips. Do this for 5 days and see how you feel. If you feel great, acknowledge it and plan to continue. If you don’t feel great, or at least better than 5 days ago….I guarantee you cheated! After about 8 weeks your body should be really used to your no added sugar plan. Then it wont be such a big deal if you have the odd indulgence every once in a while! Go cold turkey – no added sugar to the coffee or tea, and that includes the chocolate on the cappuccino! No sauce whatsoever and that includes stir fry sauces! Eat 2 pieces of fruit and make sure you get serves of vegetables every day. No biscuits, lollies, cakes or anything that turns up at kids’ birthday parties. Add protein and fat to every meal.